HAVING LIVED IN KOREA DURING MY TEENS, I WAS EXPOSED TO SKINCARE AT AN EARLY AGE. NOW, NO LONGER LIVING IN KOREA, FOR A LONG TIME I DIDN'T HAVE EASY ACCESS TO KOREAN BEAUTY PRODUCTS. SO, I WOULD ALWAYS MAKE SURE TO STOCK UP WHEN VISITING. NOW WITH KOREAN BEAUTY BEING A HUGE PHENOMENON IT'S MADE ITS WAY OVER TO THE STATES. PEACH AND LILY IS ONE OF MY GO TO'S MAINLY BECAUSE I CAN SHOP ONLINE (IF YOU ARE IN THE NY AREA THEY DO HAVE A STORE - 135-50 Roosevelt Ave Flushing, NY 11354) AND MOST IMPORTANTLY THEY HAVE A HIGHLY CURATED ASSORTMENT OF KOREAN BEAUTY PRODUCTS -- YOU CAN READ UP ON THEIR CURATION PROCESS. KEEP READING ALONG FOR THE 3 KOREAN BEAUTY SKINCARE PRODUCTS I PICKED UP FROM PEACH & LILY AND INCORPORATED INTO MY DAILY AM/PM ROUTINE. ESSENCE PLAYS A HUGE ROLE IN SKINCARE. IT PLAYS MANY ROLES TO BUILDING THE FOUNDATION OF HEALTHY SKIN. IT REMOVES ANY IMPURITIES, BALANCES YOUR SKIN'S pH AND PACKS YOUR SKIN WITH KEY NUTRIENTS IN PREPARATION FOR MOISTURIZING. I'VE LATELY BEEN USING THE CREMORLAB MINERAL TREATMENT ESSENCE. I ESPECIALLY LOVE THIS PRODUCT BECAUSE OF THE THERMAL WATER ELEMENT. THERMAL WATER IS A MINERAL WATER THAT CONTAINS HEALING PROPERTIES. SO, IT HELPS TO NOT IRRITATE MY SENSITIVE SKIN. I LIKE TO SPRITZ THE ESSENCE ONTO MY FACE AND LET MY SKIN SLOWLY ABSORB IT IN. IF THE ESSENCE DOESN'T COME IN SPRAY FORM YOU CAN BUY A SPRAY BOTTLE AND POUR THE PRODUCT IN. TIP: FOR A DEWY FINISH, SPRAY THE ESSENCE ONTO YOUR FOUNDATION BRUSH OR SPONGE BEFORE APPLYING YOUR FOUNDATION. THIS IS A NEW REGIMEN I RECENTLY ADDED INTO MY SKINCARE ROUTINE. THIS MIZON HYALURONIC ACID SERUM IS LIGHTWEIGHT BUT A POWERFUL ONE. IT SECURES MOISTURE AND HELPS TO KEEP LONG-LASTING HYDRATION. IT ALSO REPLENISHES AND RETAINS MOISTURE SO IF YOU WANT YOUTHFUL, SUPPLE LOOKING SKIN, THIS IS WHAT YOU NEED! 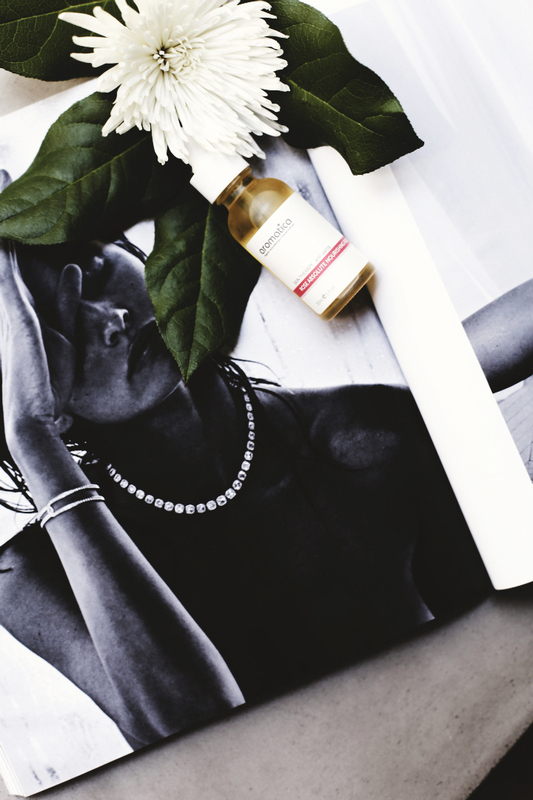 I LOVE THE AROMATICA ROSE ABSOLUTE NOURISHING FACE OIL BECAUSE IT REALLY HELPS TO NOURISH MY SKIN. PLUS, THE AROMA OF THE BELGIAN ROSE IS SO PRETTY AND IT PUTS ME IN A GOOD MOOD BEFORE GOING TO BED. I APPLY THE OIL AFTER MY ESSENCE AND SERUMS SO I CAN LOCK EVERYTHING IN. I ONLY APPLY OILS AT NIGHT, BUT IF YOU ARE ON THE DRY SIDE DON'T BE AFRAID TO USE IT IN THE MORNING FOR EXTRA MOISTURE . AND MASSAGE IT INTO YOUR SKIN. TIP: MASSAGING BRINGS CIRCULATION AND CAN HELP TO BRING EVEN TONED & PLUMP SKIN, WHICH CAN RESULT IN GLOWY SKIN. THATS REALLY ALL THERE IS TO MY KOREAN SKIN CARE ROUTINE. IF YOU HAVE ANY FAVORITE KOREAN BEAUTY PRODUCTS, DO SHARE!